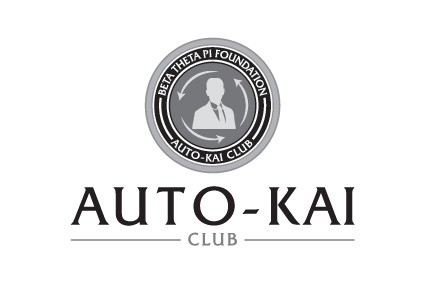 The Auto-Kai Club is the Foundation’s new giving club which recognizes Betas and friends who establish recurring electronic gifts to the Beta Leadership Fund in monthly, quarterly or yearly installments. Thousands of Betas and friends build a bridge for our young men across North America, and the Auto-Kai Club helps maximize BLF impact through simple, secure and ongoing charitable giving. Joining the Auto-Kai Club saves you time writing checks and/or giving online, and your established recurring gift means you’ll minimize the solicitations you receive from the Beta Foundation. Joining also allows you to break down your giving into more manageable amounts within your personal budget, and your ongoing BLF support will stretch across all Foundation programs and impact more students year round. Most importantly, all Auto-Kai Club members will receive periodic thank you letters from benefiting students, so you will hear directly from the Beta undergraduates you are impacting! You can join the Auto-Kai Club online here or by clicking the join button below, or you can set up your membership over the phone by calling the Beta Foundation at 800.800.BETA (2382). You can also join by establishing a recurring gift through the online bill pay options of your own financial institution or employer’s payroll department. When Betas and friends join the Auto-Kai Club, the Beta Foundation is able to improve our budget forecasting of student programs, while also lowering expenses from unnecessary solicitations. But most importantly, the Auto-Kai Club helps the Beta Foundation build and retain stronger relationships with our donors by directly connecting them to every BLF-funded leadership program making a difference for our young men of principle throughout the year. If you ever want to modify your Auto-Kai Club membership by changing your recurring gift amount, giving frequency or discontinue your membership altogether, simply contact Laura Lednik or another member of the Beta Foundation staff at 800.800.BETA (2382). Contact a member of the Beta Foundation staff at 800.800.BETA or read this FAQ document.